Some blues bands exude talent, some set feet tapping, some engage the audience with warmth and good humour and a handful tick all of those boxes and deliver a complete performance. Simon Hickling and his band are one of the few that fulfil that description. The Honeyboy on vocals and harmonica, Bob Wilson on guitar, Tony Bayliss on drums and Frank Walker on bass guitar are masters of their respective instruments and collectively form an impressively tight ensemble. The maestro demonstrated his mastery of the blues harp with the opening number of the first set, a brilliant rendition of Little Walter's “Juke”. There followed a compendium of blues styles, which incorporated the upbeat “Hey, Mattie”, the shuffle, “Just Your Fool”, and the insistent drive of “Judgement Day”, complete with some vibrant harmonica playing. The slow blues, “One Room Country Shack”, which featured lovely guitar work from Bob Wilson, was followed by Latin and Cajun rhythms and the slow rocker, “Louise”. Finally, a superb climax to the set delivered a magnificent rendition of James Harman's “Icepick's Confession” and an instrumental version of “Rockin' Robin”. The bar was raised even higher in the second set, starting with a vibrant performance of Canned Heat's “Going Up The Country” and the bouncing “Mama Luchie”. From that point onward, the dance floor was fully occupied. “Never Rains, It Pours” gave way to “Wonderful Night” and Junior Wells's funky masterpiece, “Broke And Hungry”. A brief respite was provided by Chuck Berry's “Wee Wee Hours” before the earlier pace was re-engaged with “Too Many Drivers” and a terrific version of Berry's “Let It Rock”, which afforded the opportunity for more brilliance from Bob Wilson. The specially requested Rolling Stones classic, “Miss You”, was followed by some upbeat r'n'b and a fabulous medley comprising “That's Alright” and “Mystery Train” with immaculate contributions from all four band members. The magic continued with a cracking version of “ Christo Redemptor” that Charlie Musselwhite would have been proud of. The wonderful set was concluded with “Bright Lights, Big City” and Steve Marriott's “Big Train”, which prompted a deafening demand for an encore. Very appropriately, the final number was “Promised Land”, which was precisely where the audience had been taken. The veteran blues-rocker Simon “Honeyboy” Hickling has been a mainstay of the Midlands blues scene for over thirty years. But what is notable about Honeyboy, as opposed to other veterans of the 60s and 70s scene (such as John O’Leary, for example), is his energy and undying enthusiasm for the music. From the word go, Honeyboy hits the ground running, his trusty harmonica leading the charge. Backed by a line up of seasoned musicians, there’s no holding back this firestorm of a blues player. The band are regular visitors to the Malt Shovel, usually booked to play at the venue on the lead up to Christmas. And I can understand why! A party animal at heart, Honeyboy likes to join in on the fun himself, and usually indulges in his favourite tipple at The Malt in the process. After all, it’s a relatively short drive back to Leicestershire after the gig, and he’s invariably accompanied by a non-drinking companion for the journey home. For me, Honeyboy is one act where I can get off my pundits chair and simply let my hair down (metaphorically speaking, of course, as I don’t have so much hair to “let down” any more). But don't get me wrong. If your thinking that this sounds like a rambunctious cacophony of blues and beer, think again! Honeyboy is a notable blues harp player, and knows his way around his instrument, even when standing on his head (not literally, but you know what I mean). Alternating between his hand-held "bullet" type microphone run through an amplifier and his vocal microphone, Honeyboy played some memorable blues classics, ranging from Little Walter's "Broke And Hungry" to Canned Heat’s “Going Up The Country.” He doesn't pull any punches, and his playing is straight Chicago-style blues, with a sound reminiscent of the great Little Walter. His playing is colourfully interspersed with some fine melodic runs, evoking comparisons to the legendary white bluesman Paul Butterfield. Bob Wilson (guitar) had a classy eloquent style of playing, with a solid rock tone that contained more than a hint of country. His solos were neatly articulated, without the usual verbiage associated with so many blues guitar players’ performances. His guitar playing was notable for some clever use of the tremolo arm complimenting his fretwork, and the result was a seamless confluence of sound that gave his playing a unique and easily distinguishable signature. You know when you’re listening to a Bob Wilson solo. The band performed two guitar instrumental numbers, each strategically placed at the middle point of both of the one hour, giving Honeyboy a welcome breather; but more importantly, a chance to replenish his glass at the bar. The first instrumental was Bob's own take on the Freddie King's "The Stumble" and the second way the definitive Hammond organ classic "Green Onions", both of which were dispatched professionally and efficiently without the usual fanfare associated with such perennial masterpieces. Frank Walker took a bass solo on "The Stumble", and he'll be the first to admit that soloing is not his forte. But his solo provided a mellow placido to Bob's blistering guitar work. Along with Frank on the bass, Tony Baylis on drums providing a solid back line to the band's effervescent front men. Tony, sporting a fine growth of head hair*, is another member of the band who is perfectly happy to remain in the background, and he put in a proficient and pragmatic performance on drums. All in all, a rollickingly good evening of high-octane blues. Incidentally, the postponement of Honeyboy's Yuletide appearance at the Malt Shovel Tavern was reported at the time as a little "domestic" problem with the band. It turns out that this little "domestic" was nothing less than a motorcycle accident involving Honeyboy himself. "You didn't know?" he exclaimed incredulously when I professed my surprise. "It was all over the newspaper! Heavy Drinker Crashes Motor Cycle!" he concocted, laughing at the notion. "I don't normally read the Dipso Times" I quipped, sensing his wind-up. it turns out that the accident was far from being funny at the time. Honeyboy sustained a number of cracked ribs, a punctured lung, and a badly shattered scapular! "My shoulder still hurts a bit" he added. But haven't we seen all this this before? Like with Bob Henrit? 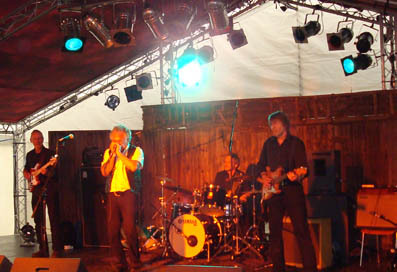 (see my review on the John Verity Band back in May 2011). It seems that these old rockers never say die. And long may they continue! 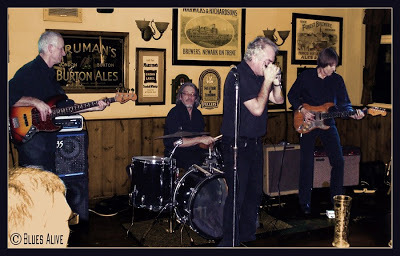 There are few bluesmen that could successfully follow a Hamilton Loomis gig but, fortunately for the punters at Garston RBL, harmonica maestro, Simon Hickling, is one who sits comfortably in that exclusive category. Backed by his excellent band, the Honeyboy hit the floor running and maintained his customary, exhilarating pace throughout a highly entertaining performance. He was also in a particularly exuberant mood and the humour flowed like honey to complement the wonderful music. The first set mixed a couple of Little Walter numbers with cracking versions of “Messin’ With The Kid” and “Broke And Hungry”, with due deference to Junior Wells. There were also some excellent original compositions – notably, the upbeat “Hey, Mattie” and the frantically-paced “Judgment Day”, which was brilliantly driven by drummer, Tony Baylis, and bass guitarist, Frank Walker. Guitarist, Bob Wilson, showed his class with his excellent interpretation of “The Stumble” and a lovely solo in the middle of a slow blues. The climax of the set was a magnificent rendition of James Harman’s “Icepick’s Confession”, which featured some great harp from the Honeyboy. The second set opened with Canned Heat’s “Going Up The Country” and the ever-popular “Mama Luchie”, followed by a sequence of rock and roll classics, including “Nadine”, “Hand Jive” and “What A Wonderful Night”, that tempted a group of local lovelies to grace the dance floor. “Miss You” was enhanced by a tasty bass-line from Frank Walker and a helping of slide guitar from Bob Wilson before Simon Hickling delivered a fabulous performance of Charlie Musselwhite’s “Christo Redemptor”. The set was completed in grand style with Steve Marriott’s “Big Train” and a vibrant delivery of “Mystery Train”. The delighted audience’s appreciation was loudly declared and suitably acknowledged by two rousing encores. Top class entertainment from a richly accomplished group of musicians, fronted by a consummate showman, whose ability to combine brilliant musicianship with infectious humour never ceases to delight. Following The Stumble’s great success in December last year, another of the UK’s class acts was lined up for the second blues gig at Fogherty’s in Liverpool. Simon Honeyboy Hickling has been delighting the country’s blues fans for a number of years now and his effervescent performances show no sign of diminishing. He was as vibrant and energetic as ever and his harmonica playing was straight out of the top drawer. Little Walter’s “Juke” set the tone for the evening and was followed by an excellent array of rhythms and tempi. The first set included the driving beat of “Hey, Mattie”, the shuffling “Just Your Fool” and a brilliant version of the slow blues “One Room Country Shack”. The set ended with a vibrant first helping of Chuck Berry. The second set opened with the band’s wonderful version of Canned Heat’s “Going Up The Country” and the foot-tapping “Momma Luchie”. It also contained “What A Wonderful Night”, which immediately had the dancers streaming onto the dance floor, “Bright Lights, Big City” and, to slow things down, “Wee Wee Hours”. Guitarist Bob Wilson fitted a couple of impeccable solos into the proceedings to give Simon a breather; and there was a magnificent rendition of “Mystery Train”, which, as always, brought the house down. Whilst the Honeyboy’s tremendous harp playing was the highlight of that number, full credit must be given to Tony Baylis’s fabulous drumming that sustained the breath-taking momentum. Special mention is also due to new bass guitarist, Frank Walker, who fitted seamlessly into the superb ensemble. “High Healed Sneakers” and “Promised Land” provided a suitably upbeat encore to complete a terrific evening. This band never fails to hit the mark, combining consummate artistry with uplifting warmth and humour. A sheer delight. Great things can happen when a visiting blues master teams up with a cracking British blues outfit and tonight they happened bigtime. First up was Simon 'Honeyboy' Hickling and his band comprising himself (vocals, harp), Al Sansome (guitar), Tony Stewart (bass) and Tony Baylis (drums). This reliable outfit produced their usual immaculate platform on which Simon could strut his stuff and what a powerful front man he is, a natural showman who sings well and plays great harp. An early pleasure was the bustling and insanely catchy "Hey Mattie" followed by a tough Texas blues with good playing from Al and then the harp tour-de-force "Don't Believe in Nothing" with divine blow bends over rock solid guitar chords. There was great variety and something for everybody, from fun singalong numbers like "Love The Life I'm Living" (uncannily telepathic ending on this one!) and a rollicking "Just Your Fool" to a deep almost gospel train blues which chugged remorselessly and hypnotically to its impressively slowed-up ending. After the break the band minus Simon backed Paul Orta and what a revelation he was. I'd heard enough on CD to know he has a good blues voice and gets a classic Chicago sound from his harps but was not prepared for the sheer impact of his live performance. He achieves a gloriously full harmonica sound through tongue-blocking and other techniques, has a deep feeling for the blues and knows just how to ride a live band till the whole thing kicks nicely. There was the urgent sweet swing of "Robbin' Little Woman" and then some deliriously beautiful slow blues with strong Big and Little Walter influences but no slavish adherence. Paul's mix of blow bends, head shakes, siren effects, wah wah sounds, triplets and sustained notes is an original and heady brew enhanced by his authentic and sincere style of singing which at times reminded me of Sonny Boy Williamson. His hands-free harp playing on Walter Horton's "Just Keep Loving Her" is a sure indication of perfect playing techniques. "Do The Boogie Woogie", which I think he co-wrote with Snooky Prior, swung like a hung ferret with Paul pulling out all the stops and even breaking out into a cool little dance. As we'd all hoped, Honeyboy joined him for the last few numbers and the word pleasure doesn't come near describing the ecstatic collision of these two harp masters. A good example was "Fine Sweet Thing' which just rocked the joint. YOU just orta have been there!